Many bar cookie recipes and brownie recipes tell you to grease the baking pan (and sometimes flour it, too) – and then spread the dough directly in the pan. 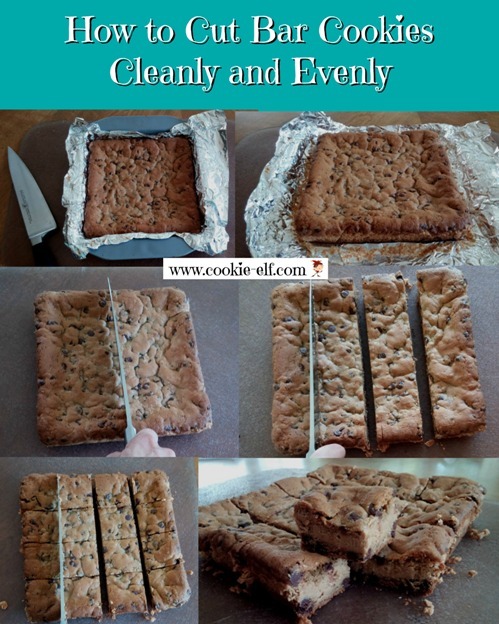 After baking and cooling, you are to cut bar cookies in the pan and remove them with a metal spatula. 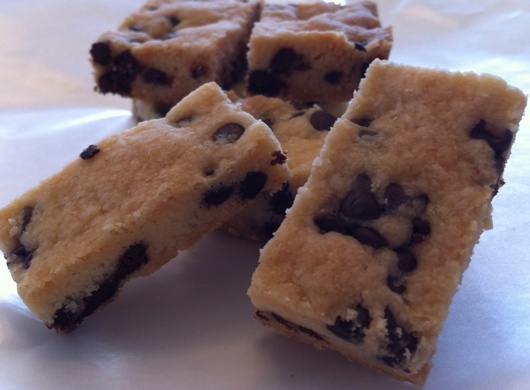 That method for cutting can work well with bar cookie recipes that have stiff batter and are firm when baked. But bars with a soft or spongy texture can be more difficult to cut and often are harder to remove from the pan cleanly. The first bar out of the pan may fall apart. Edges can be rough. A mangled cookie may taste good, but it’s not so nice to look at. Even the firmest bar cookies are easier to cut with The Elf’s foolproof method. Prepare the baking pan by lining it with aluminum foil. Allow the ends of foil to extend over two sides of the pan about 2-4 inches. Coat the foil lightly with vegetable spray. Follow the recipe directions for preparing and baking cookies. After bars are done baking, remove the pan from the oven. Let it cool completely on a wire cooling rack. Once bars or brownies are cool, grasp ends of aluminum foil and lift them from the pan. onto a cutting board. Peel away the foil carefully. Use a sharp paring knife to mark the block’s edges with even intervals. Use a sharp, oiled chef’s knife to line up marks on opposite sides and cut bars, gliding the knife smoothly through the block. Get more helpful tips from The Elf for Cutting Bar Cookies and Brownies – and be sure to check out other How-Tos for Baking Cookies on The Elf’s Pinterest board. If you cut bars or brownies while they are still warm, they will crumble. As a general rule, make sure cookies are completely cool before cutting to get best results, regardless of whether or not you line the baking pan with foil or simply grease the pan. Having said that, there are certain occasions when you should cut bar cookies or brownies before they cool. Some crisp-textured bars, such as shortbread, must be cut or scored while warm to prevent crumbling around the edges. Read a bar cookie recipe thoroughly before you begin in order to know how to cut cookies – just out of the oven or when cool.